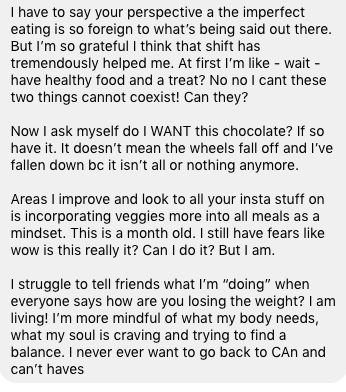 I help casualties of Whole30 and other restrictive diets stop obsessing/bingeing and start enjoying food again. feel sane around food again. I completed my final Whole30 in February 2016, and 11 days into March 2016, I ate an XL pizza, cookies, chips, a really gross chocolate cake. I mean, you name it, I ate it. A few days later, I realized that it wasn’t me and my lack of self-control that was the problem. It was that I only knew how to either be perfect with food or binge. I never learned how to do moderation. I never learned how to trust myself. That’s why I created Imperfect Eating. I created tools to help me learn how to do moderation, and it wasn’t perfect. There were times that I messed up. But now I never restrict, binge, weekend or nighttime eat. I never fear food situations. Food anxiety is at a 0, and I am able to live me life.